Headline: Mountain Green Condo 1-B03 Updated condo Sleeps 6. Centrally located in Building 1 of Mountain Green Resort with easy access to the best of Killington’s sightseeing and recreation, this property is the ultimate ski condo. 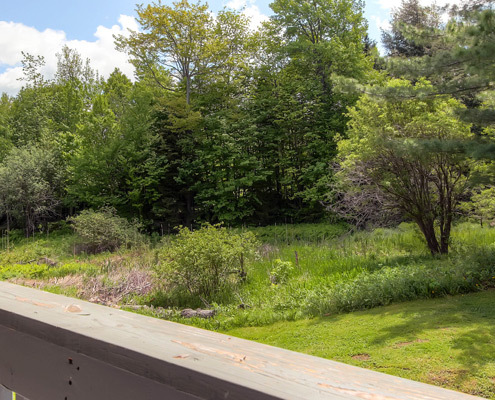 This roomy and newly updated 2 bed, 1 ½ bath condo has all of the space, privacy, and amenities you and your guests need to feel pampered and comfortable during your time in Killington. The living room outfitted with a full-sized sleeper sofa in the living room for additional guests, as well as a flat screen television for downtime entertainment between exploring Killington and a cozy fireplace to keep you warm on those chilly winter nights. The master bedroom has a plush queen bed, while the 2nd bedroom includes 2 single beds and a TV, perfect for cat naps after a day on the slopes or a restful night’s sleep. And a full-sized kitchen with an oven, microwave, dishwasher, and refrigerator gives you and your guests the option of dining in if you choose, whether you heat up your leftovers from one of the delicious Killington restaurants close by or you whip up a homemade meal from scratch. Beyond the condo, there are also a ton of community amenities for you and your guests to enjoy. Booking your stay in this condo gives you and your guests complimentary memberships to the resort spa and its array of gym equipment, spa services, pools, hot tubs, a sauna and steam room, and a racquetball court. The 54-foot heated indoor pool and one of the two hot tubs are generally open from Thanksgiving weekend through Easter weekend, though days and times are subject to change. The spa is open during ski season only, though the heated outdoor pool is open all summer long. Other onsite amenities include the Black Dog Ski Shop, an arcade, a restaurant and bar all of which are also only open during ski season. The restaurant is usually open beginning Christmas week and ending at the end of March, with varying times and dates. Other Amenities Yes, there is exercise equipment, whirlpool spa, central sauna, central indoor pool, shuttle, restaurant and bar, game room.